Welcome to HATCHBOX 3D Products Our engineered filament is here to help you stream your creative outlet, enabling you to see your thoughts and concepts engineered into a real and rewarding reality. The filaments are universally designed and compatible with 3D Printers using 1.75mm diameter filament, with a dimensional accuracy of +/- 0.03mm. PLA, or Polylactic Acid, is a commonly used thermoplastic material that does not require the use of a heated print bed. Blending a mixture of plant-based materials and polymers creates HATHCHBOX 3D Printer's PLA, making this material more suitable for the ecological balance. Because of the lower melting temperatures and lack of warping, PLA filaments retain their color vibrancy and are a common choice for displays or small household prints. The 3D printed object will have a glossy type finish with we love it: Less warping Easy to use No heated bed required. 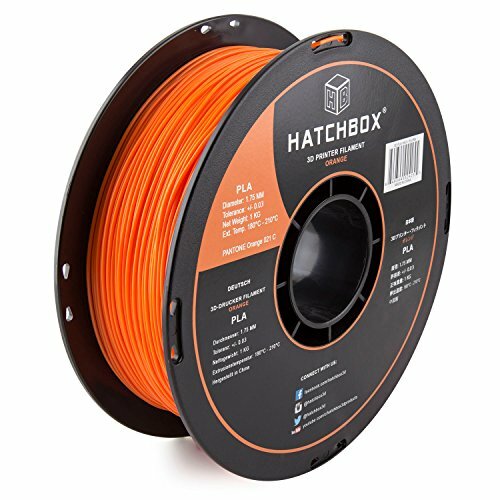 Spool Diameter: 7.88" - Spool Width: 2.69" - Spool Hub Hole Diameter: 2.20"
If you have any questions about this product by HATCHBOX, contact us by completing and submitting the form below. If you are looking for a specif part number, please include it with your message.